ラーメンボウル [Set of 2] Japanese Porcelain Ceramic Bowls w Chopsticks Ramen Soup Noodle Porridge Menudo Ramen Udon Pasta Cereal Ice cream Pho Rice Instant Noodle ~ We Pay Your Sales Tax (Puffer Fish) by We pay your sales tax at Foom App. Hurry! Limited time offer. Offer valid only while supplies last. Traditional Japanese Blue and White colored bowl. The puff fish design is nicely presented on front and back side. The bowl was treated with extremely high temperature so it is safer to use because of that the color will stay longer and are more resist to scratches. Sets include 2 Bowl details Size: 5" wide x 4" tall Made out of porcelain 2 pairs 9" NATURE WOOD chopsticks are included. However spoon is not include! 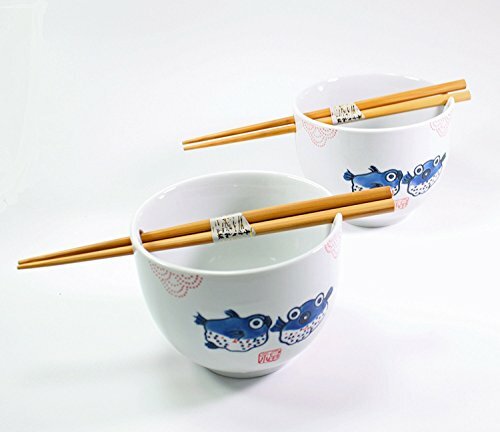 The bowls have a groove and a hole on opposite sides to place the chopsticks or narrow handled spoon. So you will have a none greasy table! A deep bowl that suits for many stuff! If you have any questions about this product by We pay your sales tax, contact us by completing and submitting the form below. If you are looking for a specif part number, please include it with your message.